The Bourse of Brussels is hosting a wild new exhibition. Giants of the Earth takes you on a dazzling journey through time. You will meet the giants of the animal kingdom: the biggest animals that have ever lived on planet Earth. The exhibition presents 30 lifelike animatronics, which each have their own story to tell. Giants of the Earth runs from 20 November 2014 until 4 January 2015, a visit to this unique family adventure can hence be easily combined with a day of Christmas fun at Brussels’ winter event Winter Wonders. 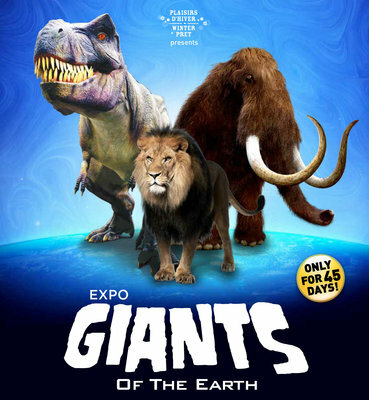 Giants of the Earth is an exciting and educational exhibition for both children and adults. This unique adventure takes you on a journey through time: during your visit you will meet the biggest animals from the Dinosaur Era, the Ice Age and the present. Giants of the Earth presents no less than 30 lifelike animatronics. You will face dangerous dinosaurs, meet a mammoth straight from Ice Age, and will also see contemporary giants like the elephant and the giraffe. Each animatronic has a different story: you will see each animal in its natural habitat, hear the sounds it made and in addition, every animal makes highly realistic movements. The exhibition also has a large interactive zone with a wide variety of activities. Family fun guaranteed! The exhibition takes place in the Bourse of Brussels and runs from 20 November 2014 until 4 January 2015. A visit to Giants of the Earth can hence be easily combined with a day of Christmas fun at Brussels’ winter event Winter Wonders. Open every day 10 AM. to 6 PM. *except on 24/12, 25/12, 30/12, 31/12 and 01/01: 10 AM. to 6 PM.